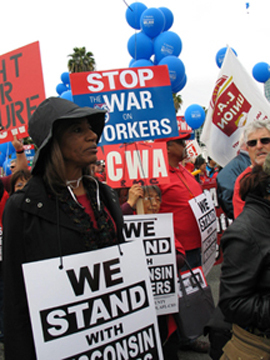 Tens of thousands of union workers rallied in Los Angeles this weekend against recent attacks against unions and working people. Workers made it clear they won’t stand for the same kind of attack on public employees here in California as happened recently in Wisconsin. California Republicans have filed an initiative with the attorney general’s office that would eliminate the right of unions to bargain over pensions or retiree benefits and would weaken pension provisions for public employees. Republicans will try to put this initiative on the November ballot. Another petition is circulating asking California's Attorney General to investigate the findings of a report made by investigative reporter Peter Byrne into self-dealing by the regents' investment committee that appears to have contributed to the university's financial crisis. A new study by UCLA business professor David Lewin and his colleagues, finds that public workers take a hit in pay in return for good benefits. "Our research says unequivocally that public-sector workers accept a lower total wage and benefits package than their private-sector counterparts,” they write. The trade-off, according to researchers, is that public-sector jobs are more secure, and health and pension benefits are generally greater than in the private sector. Another study by a Rutgers University professor shows that, nationally, public-sector employee pay is 11.5 percent lower than pay for comparably educated private-sector employees. When health and pension benefits are included, public-sector employees still earn 3.7 percent less than those in the private sector. The University of California Student Association, which represents 200,000 students, is working directly with legislators to find long-term revenue sources for education. The association is supporting California Assembly Bill 656 "Fair Share for Tuition," which would impose a 12.5 percent severance tax on oil in California with direct proceeds to go toward higher education. The UCSA is also lobbying for Gov. Brown's proposed five-year tax extensions that could save the UC system $500 million in cuts if they are approved.